Badgley Mischka will celebrate the 30th anniversary of their brand with the launch of a new eponymous fragrance. Badgley Mischka Eau de Parfum was made under licensing arrangements with TPR Holdings. 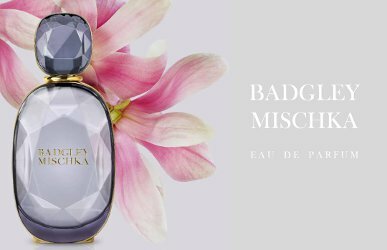 Badgley Mischka Eau de Parfum was developed by perfumer Richard Herpin, who also made the discontinued 2006 Badgley Mischka Eau de Parfum. The new effort centers on magnolia, with additional notes of tuberose, peony, amber and musk. Badgley Mischka Eau de Parfum will be available in 30 and 100 ml, and in a travel size. Look for it in October. Additional notes include pear blossom, pink pepper, neroli, iris, magnolia, jasmine, tuberose, peony, jasmine, osmanthus, sandalwood and coconut wood. Well, really, there can’t be all that many people who remember the 2006 original? I don’t think it sold like gangbusters anyway. I had a bottle of the original and it’s one of my swap regrets that I got rid of it. I still have some of the body cream, it smells very luscious. IIRC, lots of people here liked it! No, it was wonderful but not easy to wear. So huge. Must never have found its market. The new one sounds bland by comparison. It sounds understated and pretty. Hope the bottle is as pretty as it looks.